As South African media outlets search desperately for direction and relevance – tripping over hurdles, slipping on shelly beaches, falling onto swords – a quick look at the UK’s Guardian newspaper on Wednesday morning gives a timely reminder of how great journalism can be. Few would deny that the media has a crucial role to play in a democracy – holding power to account and exposing corruption and so on. Real journalism has always trumped blogging and clickbaiting and is as important as ever on the wet little island the Guardian calls home as many a Briton hopes that June will indeed be the end of May (Theresa, that is). To many in South Africa too the critical function of great journalism is not in doubt in 2017 (nor has it ever been). But, as every designer will tell you, there’s function and there’s form. When it comes to form few do it as well as the Guardian. Spend some time on the Guardian’s website and you will soon realise that the media’s desperate soul and wallet-searching is not limited to South Africa. Pop-ups and messages on the Guardian website implore readers to contribute funds to keep the wheels turning. The existence of even the great Fleet Street titles is under threat. What a loss that would be! Take just a tiny sample of this morning’s offering. From a report on a surprise appearance at TED Talks (or at least the delivery of a talk recorded at the Vatican) by Pope Francis to the irresistibly headlined: “30 years of gay style: from disco chic to hipster bears”. 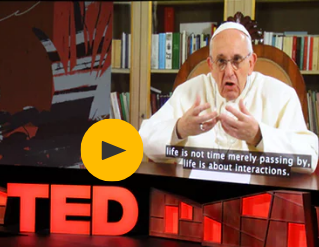 There’s even a little local almost-connection in the article about Pope Francis at TED Talks. Other luminaries of our times scheduled to give talks at the TED 2017 conference in Vancouver this week include South Africa-born global entrepreneur Elon Musk. 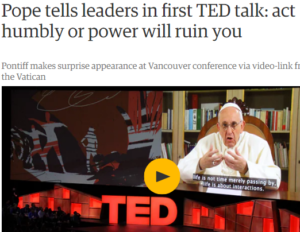 And, as with the Guardian newspaper, it seems there is something for everyone at TED 2017. 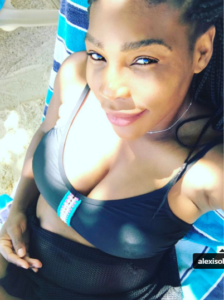 The appearance of Serena Williams – the gorgeous and phenomenal black, female sporting superstar, mum-to-be and ‘a bit of a fashionista’ – is likely to please a lot of interest groups. But let’s not forget the serious side of news gathering. For a reminder of that let me refer again to none less than the TED-talking Pontiff, who last year was quoted (in the Guardian) urging journalists to go the extra mile to seek the truth and ensure they don’t spread rumours since you can “kill a person with your tongue”. And with that it’s back to work/the killing fields for us hacks.